Imogene bought me this book last Christmas. She was with The Pastor in the grocery store and thought it was the funniest cover she’d ever seen. She begged her dad to let her buy it for me for Christmas, because she was sure it would make me happy. When I opened it, she yelled, “It’s a lady! With MAN arms!” And then she fell over laughing. So how was the actual book, you ask? Well, I gave it 4 out of 5 stars. It was a bit rambling, like these celebrity books often are. But it was funny. (And interesting to hear Tina’s perspective on the whole SNL Sarah Palin stuff.) It was funny. 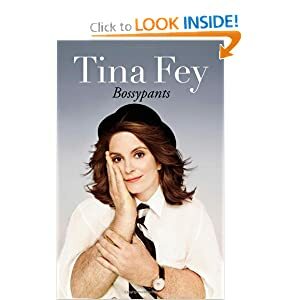 It was Tina Fey funny (and that is very funny! ).